The sheer amount of large and complex data sets, known as big data, is growing at an astronomical rate. Keep in mind data sets do not always arrive in neat packages ready for analysis either and big data is characterized by volume, velocity, and variety as described by Doug Laney. 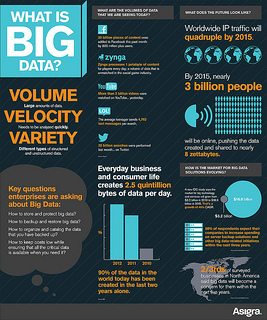 However with the right tools big data can be leveraged to generate insight and opportunities in distinctive areas. First, let’s bring in the data scientists! As Jeffrey Stanton shared in his book, Introduction to Data Science, “data scientists play the most active roles in the 4 A’s of data: data architecture, data acquisition, data analysis, and data archiving.” The process of the 4 A’s can be seen in the published reports by McKinsey or Gartner. In May 2011, the McKinsey Global Institute published an article on their studies on Big Data in “five domains – healthcare in the United States, the public sector in Europe, retail in the United States, and manufacturing and personal location data globally.” Gartner Research published a report in March 2013 highlighting the market trends in data analytics including an estimate that by 2015 there be a demand for close to 4.4 million jobs in Big Data. So how does this apply to one’s everyday life? A report in The Guardian shares that the most commonplace application of big data is exhibited in the ways retailers utilize the 4 A’s in a predictive analytics approach in hopes of increasing their sales margins. The most jarring aspect to uncover is how their approach impacts individual data privacy expectations. For example, the method Target uses to pursue new parents was shared in a recent New York Times report, highlighting how stores are developing inventive ways of collecting and utilizing data. Their analytics are able to closely predict pregnancy due dates and begin targeted marketing while shoppers are in their second trimester. Another instance of predictive analysis in retail is seen when shoppers use Wi-Fi data during shopping at brick-and-mortar stores like Nordstrom’s or Kohls. Current technology allows retailers to track shopper movements and analyze in-store purchasing behavior thus, in many ways, replicating the online shopping experience. Concerns regarding data privacy both online and off have led the European Commission to unify data protection law under the General Data Protection Regulation (GDPR). Other groups are working towards privacy in general, like the UN’s Commission for the protection of privacy (CPP), but there is no other legislation worldwide that is currently comparable to the stringency set forth on individual data privacy in the GDPR. Big data analytics can be employed for more than just market trends; it can also be utilized to perform a content analysis on public diplomacy data. As Derrick L. Cogburn and Amy Wozniak explore in their paper, Computationally Intensive Content Analysis of Public Diplomacy Data: Understanding the Public Remarks of US Secretaries of State, 1997-2011, big data analysis can be engaged to look for trends within the content of the speeches given by the US Secretaries of State. Understanding the methodology of computer-assisted analysis can aid scholars in identifying themes and pattern in international affairs research. The methodology in which big data analysis is applied will be, at times, at a crossroads with individual privacy protection. As governments, scholars, and individuals begin to understand its usages and applications, I am looking forward to witnessing an incredible level of data analysis come forth along with even more innovative applications of the material. This entry was posted in Big Data and tagged Big Data, Data Analysis, International Research, Predictive Analysis, privacy, Public Diplomacy, Retailers. Bookmark the permalink.